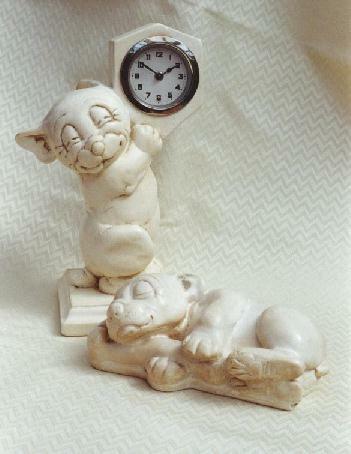 The Artisco Bonzo Clock and 'Bonzo with bone' figures. 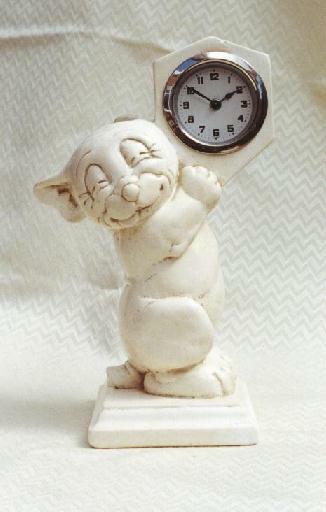 The British company Artisco made several large and beautifully detailed Bonzo figures in a plaster composite. All of the pieces here are unpainted, but it is know that some were also painted in natural Bonzo colours, with pink tongues and black spots. Some have a facsimilie signature of Studdy's engraved in them, but this is not always the case. 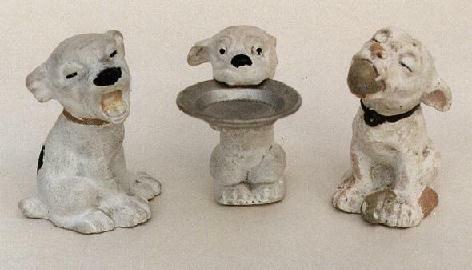 It is assumed that these were produced in the late 1920's and early 30's. 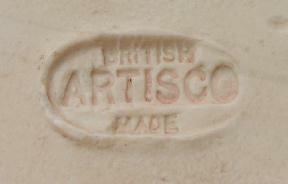 The Artisco Company mark found on the base of their figures. Although this figure is British made, the clock movement is a simple 30 hour German timepiece typical of the era. Bonzo asleep on his bone - Let sleeping Bonzos lie! 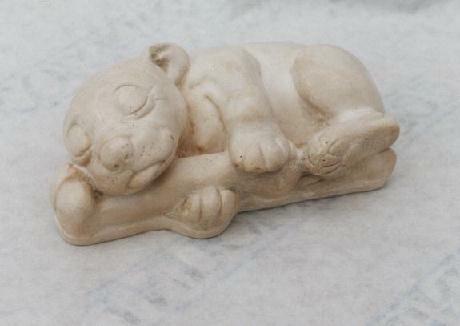 A porcelain version of this figure also exists, made by the Wilkinson China company. 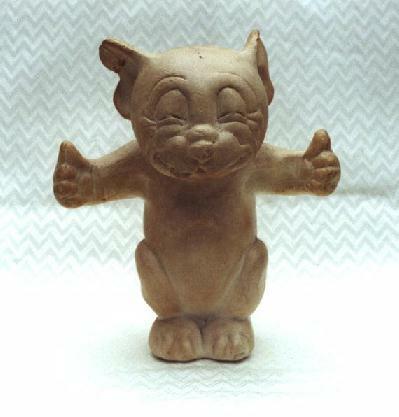 A standing Bonzo figure, giving the thumbs up! 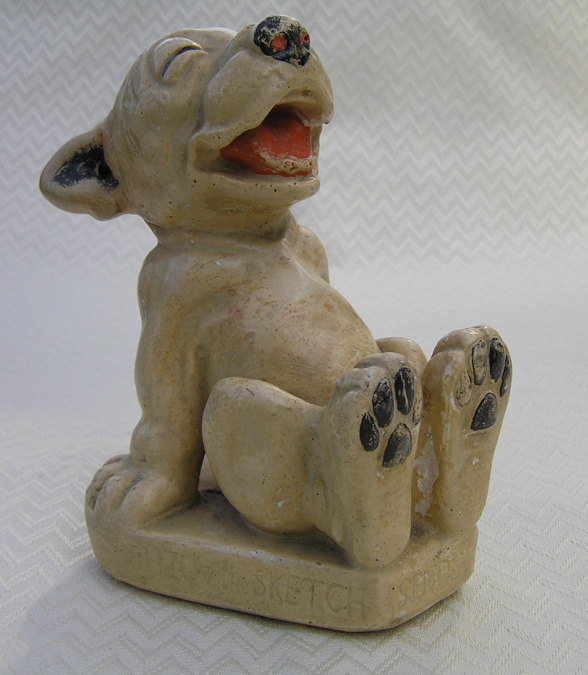 A Bonzo Bookend. 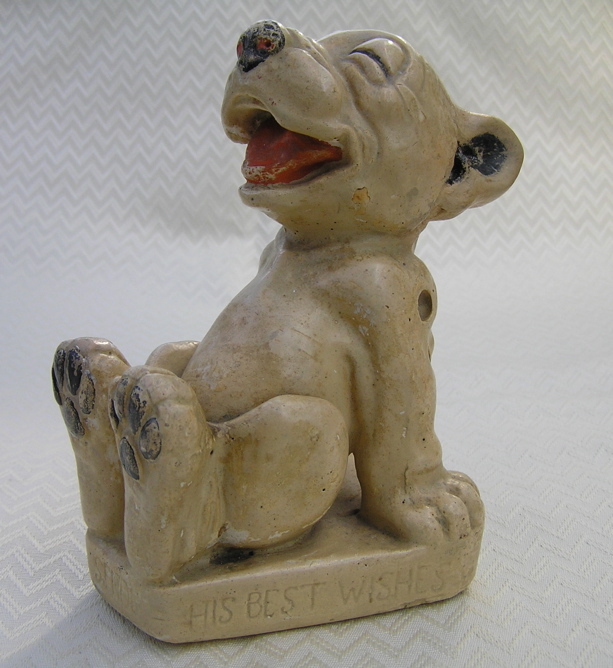 The writing around the base reads "Bonzo of the Sketch sends his best wishes", & the back has G.E. Studdy impressed into it. Although there's no makers mark on the base, I'm attributing this to Artisco as it's of the same style & quality. 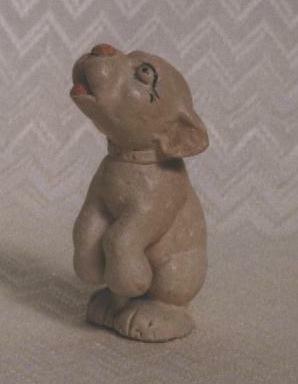 The Wilkinson China company also made a porcelain version of this figure. 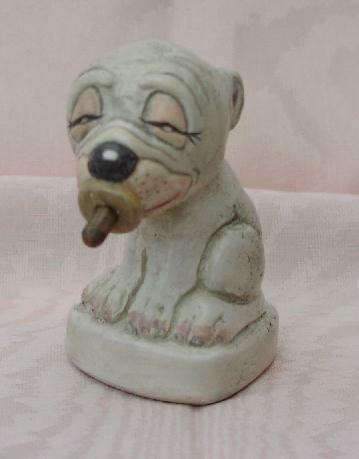 This chap appears to have a dummy in his mouth. 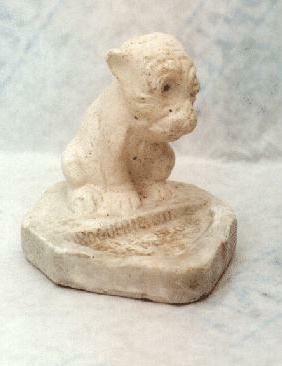 Various other companies, both in England and elsewhere, produced plaster figures in the image of Bonzo. Made as a piece of advertising, the inscription in the base of the tray reads " ". 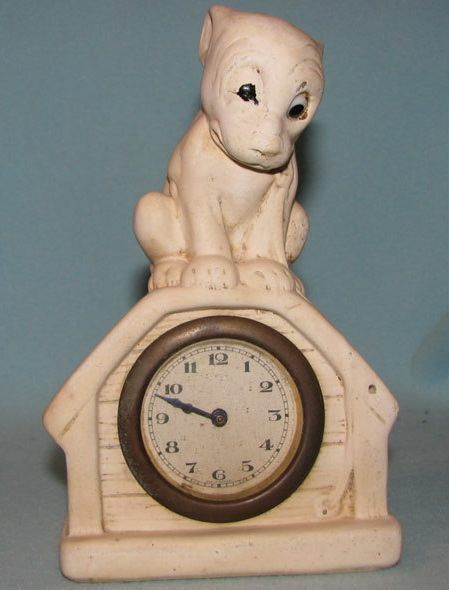 A very similarly moulded Bonzo, this time sitting on a kennel which houses a clock movement. Bonzo's left eye is glass or resin, & the should be a metal fly (or bee) attached where you can see a small pinhole on the left side of the kennel where Bonzo is looking. 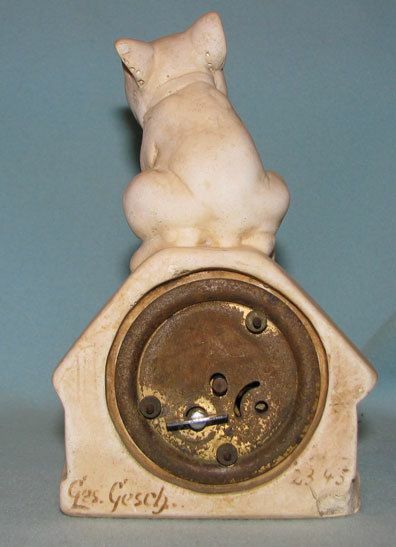 Both the plaster case and the 30 hour clock movement are German made. 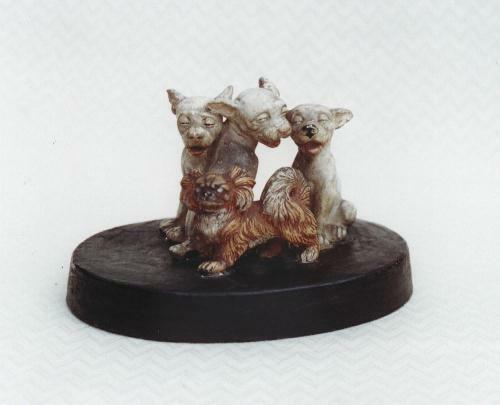 This wonderful group is a three dimensional version of the image "Carry your tail, my Lord"
A group of plaster figures modelled on the Swains Studdy Series china figures. From left to right; Tired Tim, Oliver Twist (the plate is metal), and The Ball Boy. 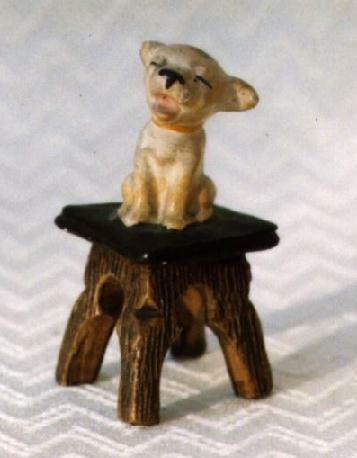 This tiny figure sitting on a stool is only about 1 inch tall! He's made from a plaster type composite, which allows for such good detail of the stool.